Aberdeen have signed former Wolves and Cardiff City defender Greg Halford on a deal until the end of the season. Halford, 34, can play at right-back or centre-back and will cover for injured pair Shay Logan and Tommie Hoban. Logan will miss up to three months following ankle surgery, while Hoban is out for the season with a knee injury. Halford will go straight into the squad to face Hamilton Academical on Wednesday, subject to international clearance. Aberdeen manager Derek McInnes told his club website: "I am delighted to bring someone of Greg's experience and ability to the club. "At this stage of the campaign, it is difficult to bring any player in, so I'm really pleased we've managed to secure someone of his stature." 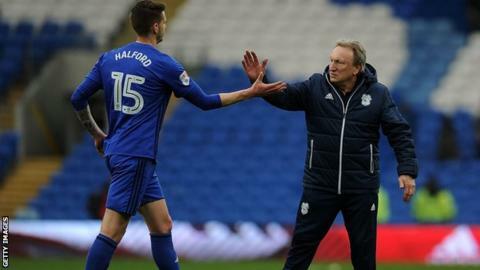 Halford made 16 appearances for Cardiff last season as they earned automatic promotion to the Premier League. However, he has been without a club since leaving the Welsh outfit in July. Halford has had spells with 12 different clubs in England making nearly 500 appearances, more than 300 of which have come in the second tier.